This is the specification document for the Solidity smart contracts required for building the Raiden Network. All functions, their signatures, and their semantics. A participant MUST NOT be able to steal funds. Therefore, a participant MUST NOT receive more tokens than he is entitled to, after calculating his final balance, unless this is due to his partner’s attempt to cheat. A participant MUST be able to eventually retrieve his tokens from the channel, regardless of his partner’s availability in the network. The sum of the final balances of the two channel participants, after the channel lifecycle has ended, MUST NOT be greater than the entire channel deposit available at settlement time. The signed messages MUST be non malleable. A participant MUST NOT be able to change the state of a channel by using a signed message from an old and settled channel with the same partner or from another channel. A participant’s payment pattern in time MUST NOT be public on-chain (smart contracts only know about the final balance proofs, not all the intermediary ones). Participant addresses can be public. The final transferred amounts of the two participants can be public. The channel deposit can be public. The system must work with the most popular token standards (e.g. ERC20). There must not be a way for a single party to hold other user’s tokens hostage, therefore the system must hold in escrow any tokens that are deposited in a channel. Losing funds as a penalty is not considered stealing, but must be clearly documented. The system must support smart locks. The system must expose the network graph. Clients have to collect events in order to derive the network graph. message_length: String of the length of the actual message to be signed in decimal representation (not null-terminated). This is compatible with https://github.com/ethereum/wiki/wiki/JSON-RPC#eth_sign and https://github.com/ethereum/EIPs/blob/master/EIPS/eip-191.md. Message content is tightly packed as described here: https://solidity.readthedocs.io/en/v0.4.24/abi-spec.html#abi-packed-mode. Onchain Balance Proof is generated by clients from Offchain Balance Proofs. Data required by the smart contracts to allow a user to withdraw funds from a channel without closing it. It contains the withdraw proof which is signed by both participants. total_withdraw is strictly monotonically increasing. This is required for protection against replay attacks with old withdraw proofs. This contract creates and remembers a TokenNetwork contract for an ERC20 Token. Raiden clients listen to TokenNetworkCreated events so they can notice when this contract deploys a new TokenNetwork. Deploy a new TokenNetwork contract and add its address in the registry. token_address: address of the Token contract. token_network_address: address of the newly deployed TokenNetwork contract. It also provides the SecretRegistry contract address to the TokenNetwork constructor. Provides the interface to interact with payment channels. The channels can only transfer the type of token that this contract defines through token_address. Channel Identifier is currently defined as uint256, a global monotonically increasing counter of all the channels inside a TokenNetwork. A channel_identifier value of 0 is not a valid value for an active channel. The counter starts at 1. We currently limit the number of channels between two participants to one. Therefore, a pair of addresses can have at most one channel_identifier. The channel_identifier will be 0 if the channel does not exist. channel_identifier: Channel identifier assigned by the current contract. participant1: Ethereum address of a channel participant. participant2: Ethereum address of the other channel participant. state: Channel state. It can be NonExistent - 0, Opened - 1, Closed - 2, Settled - 3, Removed - 4.
settle_block_number: the number of blocks in the challenge period if state is Opened; the block number after which settleChannel() can succeed if state is Closed; 0 otherwise. Channel state Settled means the channel was settled and channel data removed. However, there is still data remaining in the contract for calling unlock - for at least one participant. Channel state Removed means that no channel data and no unlock data remain in the contract. participant: Ethereum address of a channel participant. partner: Ethereum address of the other channel participant. deposit: The amount of tokens that the participant has deposited through setTotalDeposit(). Can be >=0 after the channel has been opened. Must be 0 when the channel is in Settled or Removed state. withdrawn_amount: Can be >=0 after the channel has been opened. Must be 0 when the channel is in Settled or Removed state. is_the_closer: Can be true if the channel is in Closed state and if participant closed the channel. Must be false otherwise. balance_hash: Can be set when the channel is in Closed state. Must be 0 otherwise. nonce: Can be set when the channel is in a Closed state. Must be 0 otherwise. locksroot: Can be set when the channel is in a Settled state. Must be 0 otherwise. locked_amount: Can be set when the channel is in a Settled state. Must be 0 otherwise. Opens a channel between participant1 and participant2 and sets the challenge period of the channel. settle_timeout: Number of blocks that need to be mined between a call to closeChannel and settleChannel. Anyone can open a channel between participant1 and participant2. A participant or delegate MUST be able to open a channel with another participant if one does not exist. A participant MUST be able to reopen a channel with another participant if there were previous channels opened between them and then settled. Deposit more tokens into a channel. This will only increase the deposit of one of the channel participants: the participant. participant: Ethereum address of a channel participant whose deposit will be increased. total_deposit: Total amount of tokens that the participant will have as deposit in the channel. partner: Ethereum address of the other channel participant, used for computing channel_identifier. deposit: The total amount of tokens deposited in a channel by a participant. Allowed to be called multiple times. Can be called by anyone. Before calling setTotalDeposit(), the caller needs to send the approve transaction on the ERC20 token contract so that the TokenNetwork contract can make the token transfer for the channel deposit. This function is idempotent. The UI and internal smart contract logic has to make sure that the amount of tokens actually transferred is the difference between total_deposit and the deposit at transaction time. A participant or a delegate MUST be able to deposit more tokens into a channel, regardless of his partner’s availability. setTotalWithdraw function is currently commented out and is not available. Allows a channel participant to withdraw tokens from a channel without closing it. Can be called by anyone. Can only be called once per each signed withdraw proof. participant: Ethereum address of a channel participant who will receive the tokens withdrawn from the channel. total_withdraw: Total amount of tokens that are marked as withdrawn from the channel during the channel lifecycle. participant_signature: Elliptic Curve 256k1 signature of the channel participant on the withdraw proof data. partner_signature: Elliptic Curve 256k1 signature of the channel partner on the withdraw proof data. A participant MUST NOT be able to withdraw tokens from the channel without his partner’s signature. A participant MUST NOT be able to withdraw more tokens than his available balance AB, as defined in the settlement algorithm. A participant MUST NOT be able to withdraw more tokens than the available channel deposit TAD, as defined in the settlement algorithm. Allows a channel participant to close the channel. The channel cannot be settled before the challenge period has ended. partner: Channel partner of the participant who calls the function. transferred_amount: The monotonically increasing counter of the partner’s amount of tokens sent. locked_amount: The sum of the all the tokens that correspond to the locks (pending transfers) contained in the merkle tree. locksroot: Root of the merkle tree of all pending lock lockhashes for the partner. nonce: Strictly monotonic value used to order transfers. additional_hash: Computed from the message. Used for message authentication. signature: Elliptic Curve 256k1 signature of the channel partner on the balance proof data. closing_participant: Ethereum address of the channel participant who calls this contract function. Only a participant may close the channel. A participant MUST be able to set his partner’s balance proof on-chain, in order to be used in the settlement algorithm. Only a valid signed balance proof from the channel partner MUST be accepted. This balance proof sets the amount of tokens owed to the participant by the channel partner. A participant MUST be able to close a channel regardless of his partner’s availability (online/offline status). Called after a channel has been closed. Can be called by any Ethereum address and allows the non-closing participant to provide the latest balance proof from the closing participant. This modifies the stored state for the closing participant. closing_participant: Ethereum address of the channel participant who closed the channel. non_closing_participant: Ethereum address of the channel participant who is updating the balance proof data. additional_hash: Computed from the offchain message. Used for message authentication. Potentially useful for hashing in other application-specific metadata. closing_signature: Elliptic Curve 256k1 signature of the closing participant on the balance proof data. non_closing_signature: Elliptic Curve 256k1 signature of the non-closing participant on the balance proof data. closing_participant: Ethereum address of the participant who closed the channel. Can be called by any Ethereum address due to the requirement of providing signatures from both channel participants. The participant who did not close the channel MUST be able to send to the Token Network contract his partner’s balance proof, in order to retrieve his tokens. Only a valid signed balance proof from the channel’s closing participant (the other channel participant) MUST be accepted. This balance proof sets the amount of tokens owed to the non-closing participant by the closing participant. Only a valid signed balance proof update MUST be accepted. This update is a confirmation from the non-closing participant that the contained balance proof can be set on his behalf. Settles the channel by transferring the amount of tokens each participant is owed. We need to provide the entire balance state because we only store the balance data hash when closing the channel and updating the non-closing participant balance. participant1: Ethereum address of one of the channel participants. participant1_transferred_amount: The monotonically increasing counter of the amount of tokens sent by participant1 to participant2. 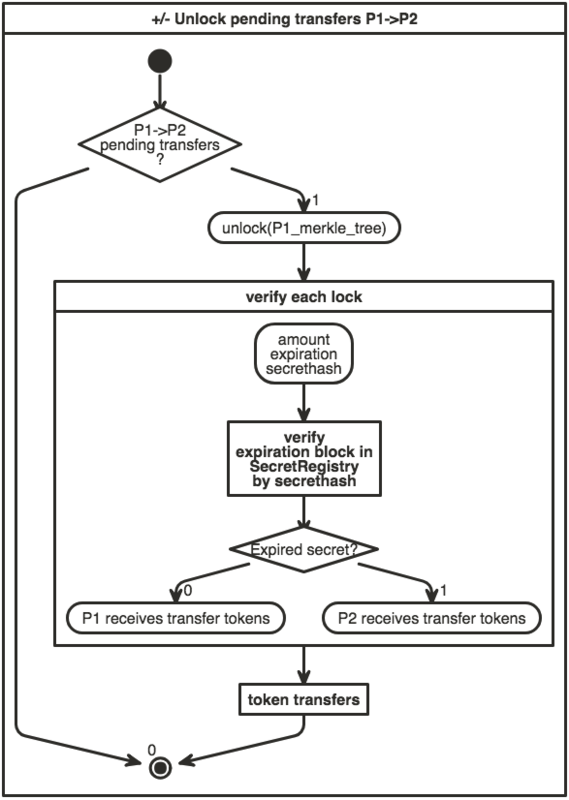 participant1_locked_amount: The sum of the all the tokens that correspond to the locks (pending transfers sent by participant1 to participant2) contained in the merkle tree. participant1_locksroot: Root of the merkle tree of all pending lock lockhashes (pending transfers sent by participant1 to participant2). participant2_transferred_amount: The monotonically increasing counter of the amount of tokens sent by participant2 to participant1. participant2_locked_amount: The sum of the all the tokens that correspond to the locks (pending transfers sent by participant2 to participant1) contained in the merkle tree. participant2_locksroot: Root of the merkle tree of all pending lock lockhashes (pending transfers sent by participant2 to participant1). participant1_amount: the amount of tokens sent to participant1 at the end of the settlement. participant2_amount: the amount of tokens sent to participant2 at the end of the settlement. Can be called by anyone after a channel has been closed and the challenge period is over. We expect the cooperativeSettle function to be used as the go-to way to end a channel’s life. However, this would require both Raiden nodes to be online at the same time. For cases where a Raiden node is not online, the uncooperative settle will be used (closeChannel -> updateNonClosingBalanceProof -> settleChannel -> unlock). This is why the settleChannel transaction MUST never fail from internal errors - tokens MUST not remain locked inside the contract without a way of retrieving them. settleChannel can only receive balance proof values that correspond to the stored balance_hash. Therefore, any overflows or underflows (or other potential causes of failure ) MUST be handled graciously. We currently enforce an ordering of the participant data based on the following rule: participant2_transferred_amount + participant2_locked_amount >= participant1_transferred_amount + participant1_locked_amount. This is an artificial rule to help the settlement algorithm handle overflows and underflows easier, without failing the transaction. Therefore, calling settleChannel with wrong input arguments order must be the only case when the transaction can fail. cooperativeSettle function is currently commented out and is not available. Allows the participants to cooperate and provide both of their balances and signatures. This closes and settles the channel immediately, without triggering a challenge period. participant1_address: Ethereum address of one of the channel participants. participant1_balance: Channel balance of participant1_address. participant2_address: Ethereum address of the other channel participant. participant2_balance: Channel balance of participant2_address. participant1_signature: Elliptic Curve 256k1 signature of participant1 on the cooperative settle proof data. participant2_signature: Elliptic Curve 256k1 signature of participant2 on the cooperative settle proof data. A participant MUST NOT be able to cooperatively settle a channel without his partner’s signature on the agreed upon balances. Can be called by a third party because both signatures are required. Unlocks all pending transfers by providing the entire merkle tree of pending transfers data. The merkle tree is used to calculate the merkle root, which must be the same as the locksroot provided in the latest balance proof. participant: Ethereum address of the channel participant who will receive the unlocked tokens that correspond to the pending transfers that have a revealed secret. partner: Ethereum address of the channel participant that pays the amount of tokens that correspond to the pending transfers that have a revealed secret. This address will receive the rest of the tokens that correspond to the pending transfers that have not finalized and do not have a revelead secret. merkle_tree_leaves: The data for computing the entire merkle tree of pending transfers. It contains tightly packed data for each transfer, consisting of expiration_block, locked_amount, secrethash. expiration_block: The absolute block number at which the lock expires. locked_amount: The number of tokens being transferred from partner to participant in a pending transfer. secrethash: A hashed secret, sha3_keccack(secret). unlocked_amount: The total amount of unlocked tokens that the partner owes to the channel participant. returned_tokens: The total amount of unlocked tokens that return to the partner because the secret was not revealed, therefore the mediating transfer did not occur. Anyone can unlock a transfer on behalf of a channel participant. unlock must be called after settleChannel because it needs the locksroot from the latest balance proof in order to guarantee that all locks have either been unlocked or have expired. This contract will store the block height at which the secret was revealed in a mediating transfer. In collaboration with a monitoring service, it acts as a security measure, to allow all nodes participating in a mediating transfer to withdraw the transferred tokens even if some of the nodes might be offline. secret: The preimage used to derive a secrethash. Currently, registerSecret() fails if the secret is zero. This contract is a registry which maps a Raiden node’s Ethereum address to its endpoint host:port. It is only used when starting the Raiden client with the UDP transport layer (the current default is the Matrix-based transport). For the UDP transport, the Raiden node must register its Ethereum address in this registry, so its endpoint can be found by other nodes in order to send the Raiden protocol messages. Registers the Ethereum address to the given endpoint. The Ethereum address saved in the registry is the address that sends the transaction (contract uses msg.sender). endpoint: String in the format 127.0.0.1:38647. Finds the endpoint if given a registered Ethereum address. eth_address: The Raiden node’s 20 byte Ethereum address. This section contains a few flowcharts describing the token network channel lifecycle. The non-closing participant can update the closing participant’s balance proof during the challenge period, by calling TokenNetwork.updateNonClosingBalanceProof. 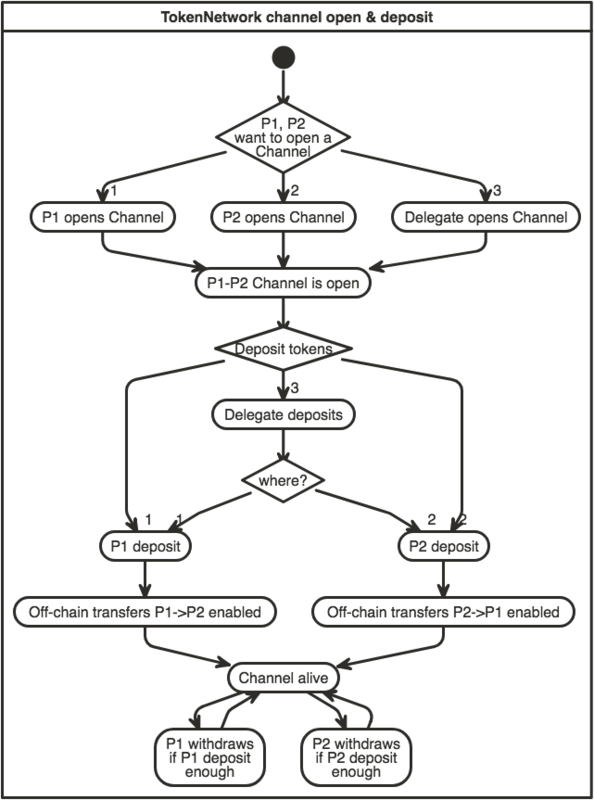 T1: Off-chain Transferred amount from P1 to P2, representing finalized transfers. B1: Total, final amount that must be received by P1 after channel is settled and no unlocks are left to be done. AB1: available balance for P1: Capacity. Determines if P1 can make additional transfers to P2 or not. D1k = D1 at time = k; same for all of the above. All the above definitions are also valid for P2. Example: D2, T2 etc. Channel deposits, channel withdraws, off-chain transferred amounts are all monotonically increasing. The TokenNetwork contract must enforce this for deposits (code here) and withdraws (code here). The Raiden client must enforce this for the off-chain transferred amounts, contained in the balance proofs (code here and here). The sum of each transferred amount and the claimable amounts from the pending transfers MUST also be monotonically increasing over time. The claimable amounts Lc correspond to pending locked transfers that have a secret revealed on-chain. even if the protocol implements off-chain unlocking of claimable pending transfers, in order to reduce the size of the merkle tree of pending transfers, the off-chain unlocked amount will be added to T and subtracted from Lc, maintaining monotonicity of T + Lc. A succesfull HTL Transfer with value tokens was finalized, therefore T1t == T1k + value and L1t == L1k. A locked transfer message with value was sent, part of a HTL Transfer, therefore T1t == T1k and L1t == L1k + value. A HTL Unlock for a previous value was finalized, therefore T1t == T1k + value and L1t == L1k - value. A lock expiration message for a previous value was done, therefore T1t == T1k and L1t == L1k - value. The Raiden client MUST not allow a participant to transfer more tokens than he has available. Enforced here, here and here. Note that withdrawing tokens is not currently implemented in the Raiden client. A mediated transfer starts by locking tokens through the locked transfer message. A user cannot send more than his available balance. Enforced in the Raiden client here. do not take into consideration the pending transfers from P2: L2, because the token distribution will only be known at unlock time. Also, the amount that a participant can receive cannot be bigger than the total channel available deposit (9). Therefore, the available balance of a participant at any point in time cannot be bigger than the total available deposit of the channel ABI1 <= TAD. (6 R) is deduced from (5 R). It is needed by the Raiden client in order to not allow a participant to withdraw more tokens from the on-chain channel deposit than he is entitled to. Not implemented yet in the Raiden client. The scope is to correctly calculate the final balance of the participants when the channel lifecycle has ended (after settlement and unlock). These calculations will be done off-chain for the cooperative settle. For each participant, we must calculate the netted transferred amounts and then the token amounts from pending transfers. Note that the pending transfer distribution can only be known at the time of calling unlock. The above is easy to calculate off-chain for the cooperativeSettle transaction, because the Raiden node has all the needed information. the settleChannel transaction MUST be able to handle valid old balance proofs in a way that participants cannot be cheatead if their partner uses such a balance proof. settleChannel MUST be able to handle invalid balance proofs (not constructed by an official Raiden client). However, the smart contract has no way to ensure correctness of the final balances. SL1: pending transfer locked amount, corresponding to L1 that will remain locked in the TokenNetwork contract when calling settleChannel, to be unlocked later. Because the TokenNetwork contract can receive old balance proofs from participants, the balance proof values might not respect B1 + B2 = TAD. The TokenNetwork contract might need to retain SL1 != L1 and SL2 != L2, as will be explained below. The problem is that, in Solidity, we need to handle overflows and underflows gracefully, making sure that no tokens are lost in the process. For example: S1 = D1 - W1 + T2 - T1 - L1 cannot be computed in this order. D1 - W1 can result in an underflow, because D1 can be smaller than W1. a set of additional constraints that MUST be enforced in the Raiden client. RmaxP1: the maximum receivable amount by P1 at settlement time; this concept exists only for handling the overflows and underflows. This ensures that calculating RmaxP1 does not overflow on T2 + L2 and T1 + L1. Enforced by the Raiden client here. This is enforced by the TokenNetwork contract here. The overflows and underflows do not happen for a valid last pair of balance proofs. They only happen when at least one balance proof is valid old or the TokenNetwork contract receives invalid balance proofs. TLmax2 - TLmax1 underflow is solved by setting an order on the input arrguments that settleChannel receives. The order in which RmaxP1 and RmaxP2 is computed does not affect the result of the calculation for valid balance proofs. (7 R) solves the + D1 overflow: T2 + L2 - T1 - L1 <= D2 - W2 –> T2 + L2 - T1 - L1 + D1 <= D1 + D2 - W2. (12) makes sure D1 + D2 has no overflow. We bound RmaxP1 to TAD, to ensure that participants do not receive more tokens than their channel has available. underflow is solved by the above bounding of RmaxP1 to TAD. We bound L2 to RmaxP1 in case old balance proofs are used. 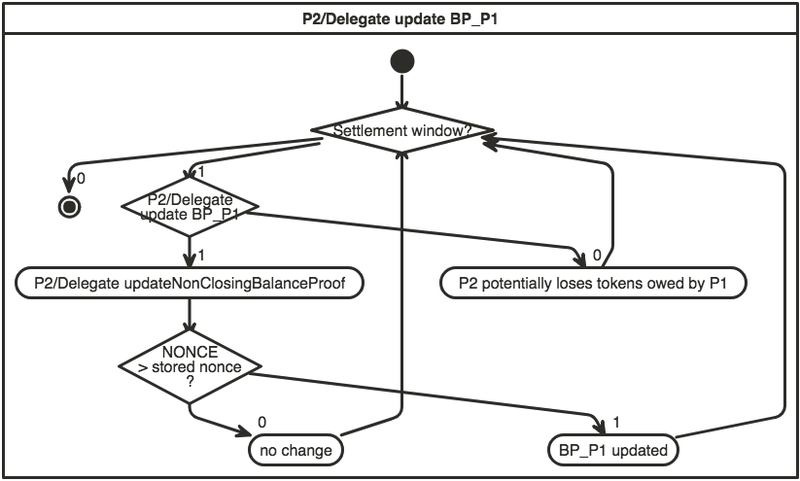 There are cases where old balance proofs can have a bigger L2 amount than a later balance proof, if they contain expired locks that have been later removed from the merkle tree of pending transfers or contain claimable locked amounts that have been later claimed on-chain. underflow is solved by the above bounding of L2 to RmaxP1. We bound L2 to RmaxP1 in case old balance proofs are used. underflow is solved by the above bounding of L1 to RmaxP2.